150INTERNATIONAL will give free international shipping on orders of $150 and up. 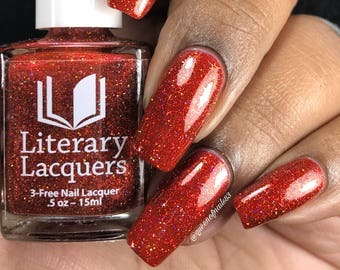 Please like the Literary Lacquers Facebook page for updates on restocks and advance looks at upcoming collections! Thicker than expected but long lasting. Such a pretty color. I had to have a back-up! Thanks to seller for suggestions and special handling on this order! It seems like every color I try from this shop is my new favorite color! Wonderful polishes, thanks! 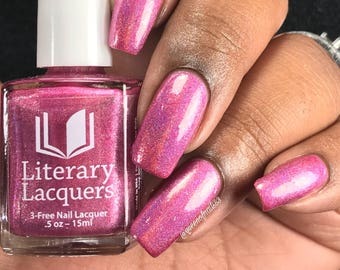 I am super impressed with the quality of this polish. Applied beautifully and has excellent lasting power. REALLY nice. Thank you so much! 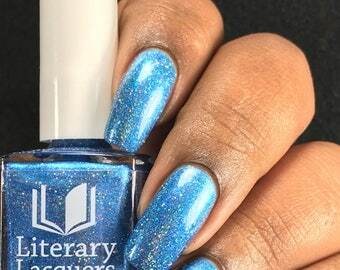 Literary Lacquers was founded at 7,000 feet above sea level in the high desert of Santa Fe, New Mexico in 2012 out of a desire to combine my two biggest passions: literature and polish. 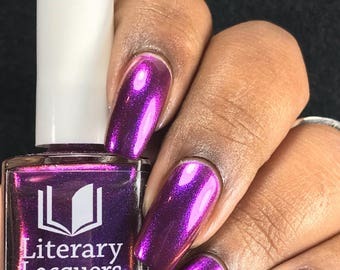 Each polish is inspired by a literary reference and I attempt to evoke in color and texture the feel of the passage or work to me. I'm fascinated with the way that light passes through polish and bounces off shimmers and glitters and I've worked to develop complex and original finishes to my polishes. All of the polishes are 3-free and each contains two stainless steel shaker balls. All of my purchased shipping materials are 100% recycled and my greenwrap is 100% compostable as well as being recyclable. It's even cute! 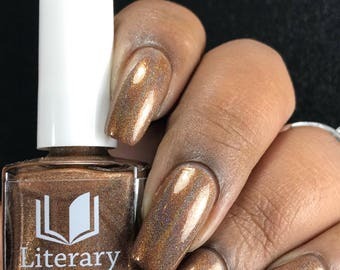 Obsessed with cosmetics in general and nail polish specifically, Amy has been driven to create and share polishes inspired by works of literature. Running on a steady diet of coffee, literature, and glitter, Alex is a passionate advocate of the marriage between polish and prose. 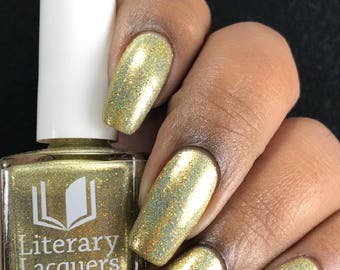 Welcome to Literary Lacquers! I strive to create unique and complex polishes inspired by works of literature. I use only recycled shipping materials and special greenwrap that's compostable and recyclable. I love polish and the polish community and hope to bring joy to you with my creations. Each batch is handmixed with joyful loving intent in the high desert of Santa Fe. Because each polish is created by hand, there may be some variations among bottles. 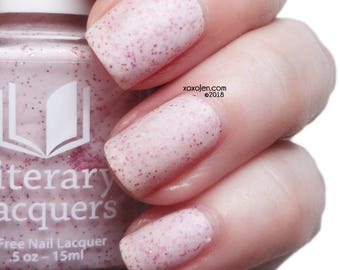 In the case of a breakage in shipping, please contact me with a photo of the damage and I will replace (or refund, if the polish is not available for some reason) the polish and shipping costs. If you have a problem with the formulation, please let me know. Polish is an interesting medium to work with. Sometimes ingredients do weird things and while I do thoroughly test my ingredients, it's impossible for me to replicate every polish storage situation. I recommend storing nail polish in a cool, dry place out of direct sunlight. A. Yes, I charge 6.625% GRT to New Mexico buyers. A. If you have not received a shipping notice, you can cancel your order. Current turnaround time 5 business days, though in the holiday season or during large launches that time may be longer. Please check your confirmation email for more information. On occasion, a package may be lost, or not make it through customs. I cannot be responsible for what happens once the package leaves my hands but if your package goes missing, please contact me and I will do my best to work something out. During Winter Holiday season, packages can be delayed. I add delivery confirmation to packages for tracking purposes. My customs waiting list is very long right now and I'm not taking any additional custom orders right now. I welcome any and all general conversation about nail polish and polish creation. I will happily discuss wholesale accounts with anyone interested!